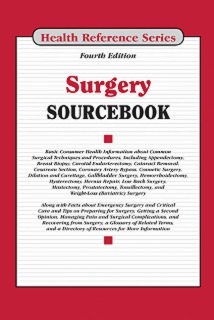 Surgery Sourcebook, Fourth Edition describes the most common surgical procedures, including appendectomy, breast surgery, carotid endarterectomy, cataract removal, cesarean section, coronary artery bypass, cosmetic surgery, dilation and curettage, gallbladder surgery, hemorrhoidectomy, hysterectomy, hernia repair, low back surgery, prostatectomy, tonsillectomy, and weight-loss (bariatric) surgery. The book discusses preparations patients may want to make prior to undergoing surgery, including choosing a surgeon, getting a second opinion, and donating blood, as well as postsurgical physical discomforts, nutrition and exercise considerations, and strategies for facilitating recovery. The book concludes with a glossary of related terms and a directory of resources for additional help and information. Part I: Introduction to Surgery provides basic information about surgical specialties, including general surgery, neurosurgery, obstetrics and gynecology, ophthalmology, orthopedic surgery, otolaryngology, plastic surgery, urology and facts about medical tourism. It discusses specific types of surgical techniques—including laparoscopic surgery and laser surgery—and special surgical considerations with pediatric and geriatric patients. The part concludes with the latest research on surgery. Part II: Preparing for Surgery offers patients information on finding a qualified surgeon, obtaining a second opinion, preparing for surgery, and dealing with preoperative anxiety. It provides information about ambulatory surgical centers and anesthesia. The part also discusses blood donation prior to surgery, tips on ensuring patient safety and preventing medical errors, financial planning facts, and the use of advance directives. Part III: Common Types of Surgery and Surgical Procedures provides details about head and neck, eye, dental, breast, lung, heart and vascular, joint and spine, gastrointestinal, weight-loss (bariatric), gynecologic and obstetric, and urological surgeries. The part also highlights cosmetic and reconstructive surgical procedures, such as abdominoplasty, blepharoplasty, liposuction, rhinoplasty, and surgery for skin. The part concludes with information about organ transplants and emergency and critical care surgery. Part IV: Managing Pain and Surgical Complications focuses on the postoperative period and discusses methods for controlling pain, managing blood loss, and preventing surgical site and healthcare-associated infections that may develop during hospitalization, such as catheter-associated urinary tract infections and methicillin-resistant Staphylococcus aureus (MRSA). The part also identifies other complications that may affect surgical patients, including abdominal adhesions, deep vein thrombosis, pneumonia, sepsis, and breast implant complications. Part V: Recovering from Surgery offers insight into the process of recovering from surgery. Hospital discharge planning, postsurgical nutrition, and strategies for caring for incisions, surgical drains, and ostomy bags are discussed, along with information about blot clot risks and traveling after surgery. Part VI: Additional Help and Information provides a glossary of important terms related to surgery and a directory of organizations that offer information to people undergoing surgery or their caregivers.